I wrote a bit about the back room the other day and included a photograph. 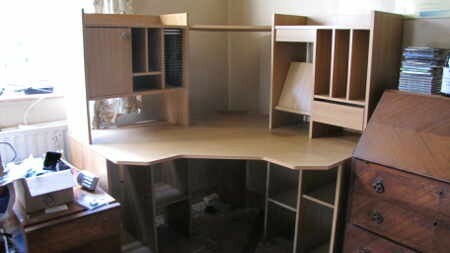 Now the main yoke there is a corner desk which I used as an office in the Bad Old Days when I ran a wee company. It’s a grand desk and considering the use it got it’s in good shape. I was going to smash it up and throw it over a hedge somewhere but then I discovered it could easily be dismantled using a screwdriver instead of a lump hammer. Maybe someone would like it and find a use for it? I advertised it. Price – free. Do you think there was any interest? It’s still there, leering at me through the open door. Maybe if I had priced it at a couple of hundred, then people might think it’s worth something and queue up for it? People can be weird sometimes. Heck, I’d take it in a heartbeat and would except for the logistics of the thing. Two: Our computer room lacking the room and right-angled corners necessary for placement of said desk (house is what they call a “story and a half” so upper rooms have partially sloping walls). Otherwise, that thing is pretty much my dream desk so to speak. If you’re prepared to pay for the postage you can have it for nothing. Maybe you could leave it outside and keep pigeons in it? Now that’s an idea. I’m sure the various birds would just love to have a landing pad while waiting their turn at the bird feeder. And our oversized deck is just full of right angled corners (about 4 of ’em I think). I’ll talk to the wife about it, eh? Free is too cheap, people think it’s worthless and won’t bother. I thought that myself. Two people showed interest but neither has gone any further yet. I’ll leave it advertised for a few days and then bin it if no one is interested. Cross out free and replace with 20 punts or whatever you use these days. Anything that’s free is worth what you pay for it. As Mr Woodsy42 says, if it’s free people will think you think it’s junk and will assume you are right. Brexit was the biggest vote of most people’s lifetime; but, 27.7% of the eligible voters could not be bothered by voting. Yet, people complain that the govt pays them little attention. In Edinburgh there are several charities that’ll uplift any item of furniture, then sell it through their shops. Perhaps they have something like that in your part of the world, though I may be so bold as to suggest you ignore the cancer charities. Maybe the Sally Army. If you lived where I live, you could put it outside with a “For Sale” notice on it. It will be gone the next morning! Do you have a local Freecycle site? Works well for me. Or a local Emmaus village, our one specialises in teaching homeless guys woodworking skills to refurbish furniture. It collects useful items like yours pretty promptly. You do indeed have a Freecycle site but it looks like Emmaus is UK only. Yup, I do have a Freecycle. And it’s on that for the last few days. No response!